In a world where technology never ceases to stand still, we are still seriously impressed with what it’s used on. Being in the office furniture industry has kept our eye our for trends, but this one HAS to take the cake. 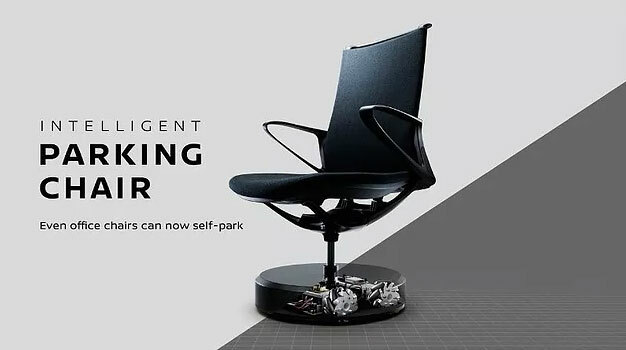 When we saw Nissan’s video of their new self-parking chair concept, we almost fell out of OUR office chairs. The creator of the self-parking car decided that us moving our chairs back and forth is just action we cannot bare to take any longer. Unfortunately, this only remains a concept (for now). The chair is able to make 360-degree turns, zero in on a target location, and then literally put itself away. The sensors communicate with a network of four cameras positioned throughout the room the 360-degree-turning chairs are in. Clearly if you and your office appreciates some technology embedded beyond your computer and into your seating, this might be the new office furniture addition for you. There is no clear date as to when and if these bad boys will be available, but we assure you that we will let you know as SOON as it happens. For any other questions or requests for information on office furniture, please reach out to us here! This entry was posted on Monday, July 10th, 2017 at 4:04 pm. Both comments and pings are currently closed.